Earlier this month the GSPCA once again attended the South Show and had a fabulous two days. The GSPCA stall was out with lots of fund raising tombola fun games and GSPCA Committee Member Karen Girdlestone helped judge the fun dog show held on the Saturday. 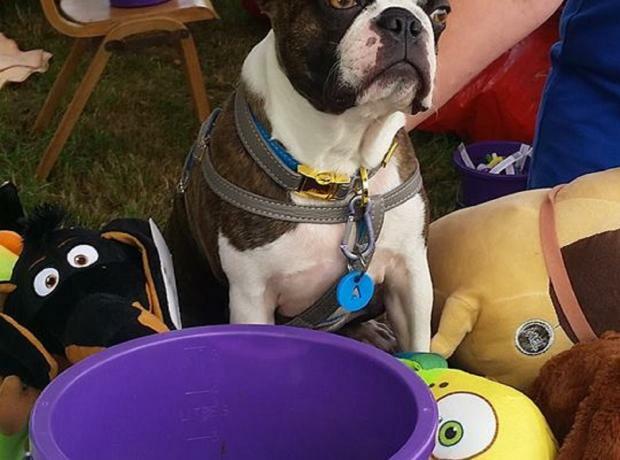 Last month the GSPCA joined in with the fun at the South Show and enjoyed two days of festivities and raising funds for the many animals at the GSPCA, promoting the work of the Shelter and also helped judge their fun dog show. This year the fun dog show had some fantastic prizes from Creature Comforts, South Show committee made rosettes and the Best in Show was a new cup sponsored by Forest Stores. Come and join the South ‘Fun Dog Show’ 2017 at the South Show at St Martins Community Centre Field on Saturday 12th August. The Show opens at 10.00 and to register they are asking you arrive before 2.50pm for a 3.00pm start. Just £1.00 entry fee per dog and you can enter as many classes as you are eligible for. All Dogs must be fully vaccinated and kept on a lead at all times. All Island dogs are welcome. Compered & judged by Steve Byrne of the GSPCA and supported by Creature Comforts. Last Friday and Saturday the GSPCA joined the South Show for a sunny and fun two days in St Martins. The Friday proved very popular with many families enjoying the bouncy castles, games and of course the Bonnie Baby competition. The Saturday also teamed with visitors and in the afternoon the GSPCA Manager helped run the fun dog show which had over 80 entries between the 8 fun classes and saw dogs of all sizes. Last Friday and Saturday the GSPCA manned a stall at the first of the summer shows in St Martins. With Friday proving quite challenging with wet weather and Saturday in the sun the team enjoyed the two days fund raising at the wonderful local event. With plenty of games and shelter under the two gazebos from the rain and sun the stall proved very popular and raised a grand total of £423.29p. Steve Byrne GSPCA Manager said "We had a great time at the South Show last week and even with the wet Friday we were kept very busy."